Belief in ghosts is one of those universal archetypes that Carl Jung found across all cultures. From India, to the Philippines, to Africa and back ghosts haunt dark roads and old stories. Many cultures have entire holidays dedicated to ghosts. In China, the Hungry Ghost Festival or the Ullambana Festival of Buddhism is more typically called the “Ghost Festival”. Ghost Festival is celebrated throughout Asia and called by many different names. 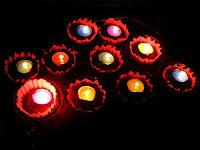 It is celebrated during the fifteenth day of every 7th Lunar Month. This would typically be July but Lunar months aren’t calender months so this year Ghost Festival falls on August 31st. In Hong Kong and Taiwan, Ghost Festival is celebrated for the entire month. In Chinese folklore, the people believe that the 7th month is a time for ghosts. It is believed that the gates of the underworld are thrown open and hungry ghosts roam the earth looking for food. Ghost festival is deeply tied to traditions of ancestor worship and people leave items out for the ghosts of their ancestors. Some people light lanterns by the roadsides to help the ghosts and other provide shoes for the ghosts. One of the most beautiful costumes associated with this festival is the lighting of lanterns and setting them adrift in the water. These lanterns serve as guiding lights for the lost and wandering ghosts. Other traditions call for the burning of offerings such as paper and incense and the leaving of food for the hungry ghosts. In Hong Kong and Taiwan, Ghost festival is celebrated by a month of operas and performances to honor the dead. The origins of the ghost festival can be found in Buddhist scriptures. “In Buddhist culture, “Ullam” means “hanging upside down” in Sanskrit; “bana” means “a vessel for holding offerings of food”. Buddhists hold that the vessel is capable of removing the extreme suffering of one’s deceased parents in purgatory. This originates from the story of “Monk Mulian Saving His Mother” in Buddhist sutras. Buddhist disciples set Ullambana all over the place, symbolizing food provision for the people, adding fortune and longevity to their living parents and releasing deceased parents from sufferings.”.. Cultural China.com. Ghost Festival reminds me of the Catholic tradition of lighting candles for the dead. It is a way to remember and honor those who have gone before us. I thought we’d put together a little ghost festival in our house this year. We’ve lost quite a few people and helping the spirits of those we’ve lost seems appropriate. Mooncakes are typically offered to spirits in china. We don’t have mooncakes so we will cupcakes. My son has made origami animals to burn with the incense and we will light lanterns on the back patio to guide our family’s ghosts home.